Raja left a comment telling me to go to New York for my spirit. Since I always listen to Raja I'm now on the Megabus heading for New York. Seriously, I've been planning the trip for awhile. One of my Israeli friends whom I haven't seen for a long time will be there and we'll spend a few days together.Last week was busy and good; I continued to feel as well as I did before I took that fall. Monday evening, six other Osher members and I participated in an undergraduate psychology class. The kids seemed to enjoy hearing our life stories, mostly in 500 words or less, and then told us about papers they had written about elder issues. I was impressed with how varied our experiences were, but I imagine it would be true for most Osher members. On Tuesday I attended the fourth in a series of talks on preparing for death; this one about hospice and palliative care. I'll miss this week's talk about grieving, but hopefully I've done my share and won't have another turn. The talks all emphasized the importance of talking to your family and your doctor about what you want done at the end of your life. They also recommended a guide called Five Wishes. You can download it here. I've had a healthcare advance directive and living will for many years, but I plan to supplant it with this new document. It makes much more sense to me. My book-making group will have a holiday party on Sunday, right after I return. The highlight of the festivities is to exchange books with each other. I've been working on mine all last week. I'm not quite finished but I'll have time on Saturday afternoon. The picture of the media delivery box that seemed to be recognizable no matter how I turned it, will be on the cover of a box. Inside will be little one-sheet books with pictures of mosaics that were down the street from the box. I'm calling the box and the little books Burning Box Imager. I'll post pictures when I get home and finish the box. They aren't keen on sunshine. Today was supposed to be up in the 50's. Maybe it got there between 1 and 1:15, but it was cold by 3 o'clock. I know spring will come but it won't be soon just because that animal didn't see its shadow. On another subject entirely, I keep thinking about this poster. I saw it in a window in Kentucky when I was down there. 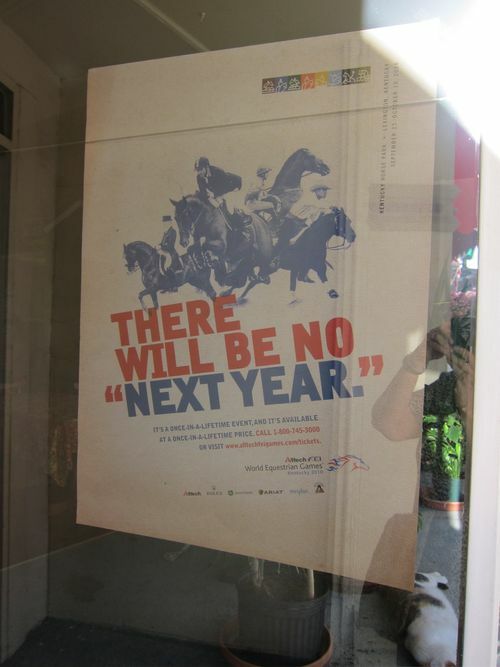 It's a simple message: buy your tickets for this special horse show, because you won't have another opportunity next year. Of course, I think of it a little more broadly. I liked it so well I asked Raja to get me a copy, and being a wonderful friend, she did. I know she thought this was just another example of what she sees as my pessimism. We've had a few discussions on the subject. I see myself as a thoughtful realist; she doesn't agree. I guess she thinks I wanted it because I don't think there will be a next year for me. Truth is, it reminds me to do things now, not postpone them. It's a good message. to eighth grade, then passed into high school, etc. When I die, I will die, I WILL NOT PASS. I don't understand this nonsense about passing. I just heard Joe Klein, who writes for Time, talk about when Richard Holbrooke "passed." Not the first time I've heard this on NPR and not the first time it has annoyed me. Somehow I expect better from them. Why are we so afraid to say "death," or "died?" Or are we implying that people have passed to another reality? another dimension? Or am I just being obtuse in not understanding we think they passed on to heaven? Or failed, if you went to hell? I think language is important. Death is a part of life. Not being able to acknowledge it, distorts our understanding of life. When the time comes I shall die; I shall not pass. This was a workshop to learn techniques and make product. All of our materials were provided, mostly cut to size with only a few adjustments necessary. 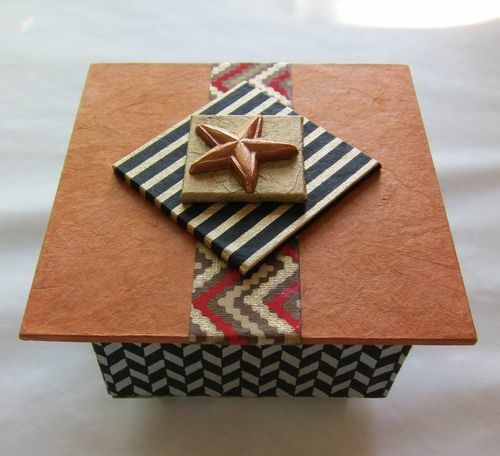 We began on Monday making four small books, using folds and tabs with no adhesive necessary. 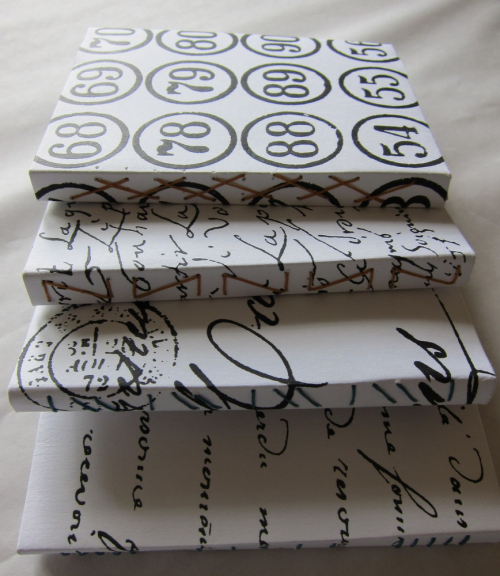 Signatures were stitched into the book creating different patterns on each spine. This technique really interested me; it’s much better for me than using glue. I plan to explore further. 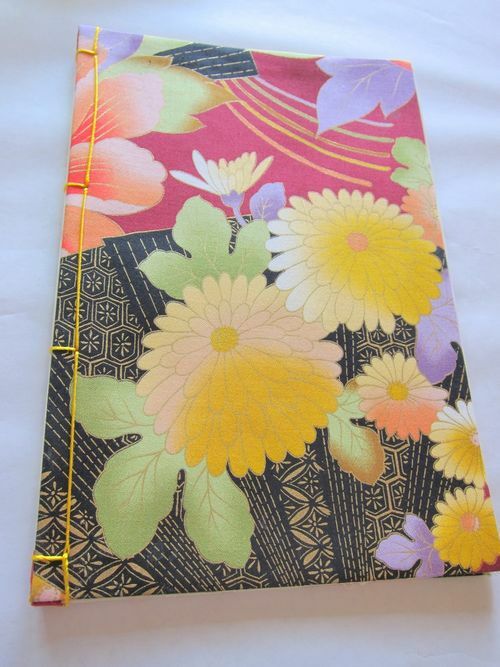 In the afternoon we made a soft cover Japanese stab bound book. This is the method I’ve been using to bind my books, although I never use soft covers. The interesting part, for me, was making book cloth for the covers. At the end of the day we had five books. I normally work very slowly. Just had to finish the butterfly stitching and stitching on two of the.small books. I went home completely exhausted and crawled into bed by 8:30. Tuesday we began with a book with a butterfly binding. Again this is a stitch that becomes a decorative statement on the outside of the spine. Boards for the spine and covers were precut for us. 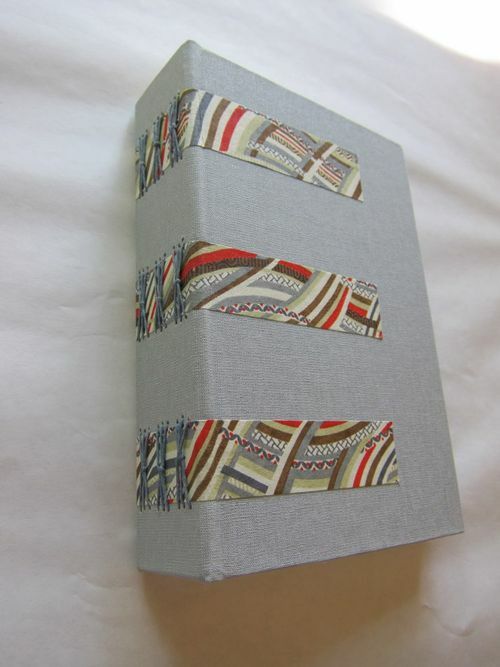 We had our choice of bookcloth, endpapers, and linen thread for the stitching. Text block papers were provided precut. We folded and punched holes. In the afternoon we did origamizo, folding and dying papers. It’s an interesting process, but you never know exactly what will result. I can’t say I was happy with anything I made; maybe in time I’ll feel differently about it. I wasn’t so tired Tuesday night and was able to work on my unfinished books at home. Wednesday was build-a-box day. Pam provided precut, thick boards for top, bottom and sides. We had to make size adjustments on the sides, giving us the opportunity to cut the thick board. Then we chose 10 different papers to cover the box, inside and out, top and bottom. We also received instructions and materials for making a half-size box. This is one of the projects I will work on when I return from Chicago. Thursday we created a bradel book: an old-style, fully bound book with a curved spine. The text block was made from watercolor paper, eight sheets cut from three full size sheets then folded and punched for stitching. 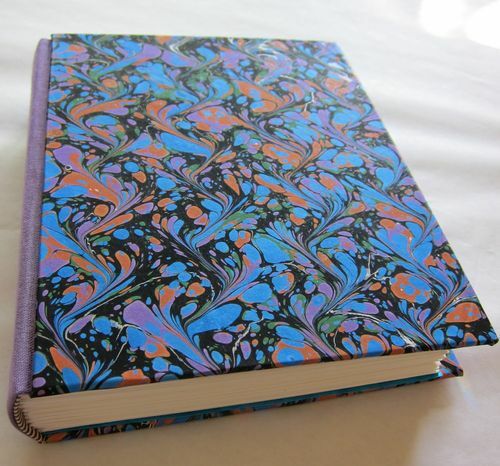 The book has that fancy tape on the edges of the spine, heavy board covers and beautiful end papers. It’s obviously too precious to use. This was another wipe-out day; I was very tired all day and also had afib all day, making me feel really awful. I’m still trying to figure out what sets off the afib; maybe tired had something to do with it. I doubled the meds in the evening and have been OK since. Again, I don’t really know if this is a fix or maybe a placebo effect. Friday we began with some single page, folded books. You can download and print some artist designed papers here. Using the same fold we made pages for a journal in a box. 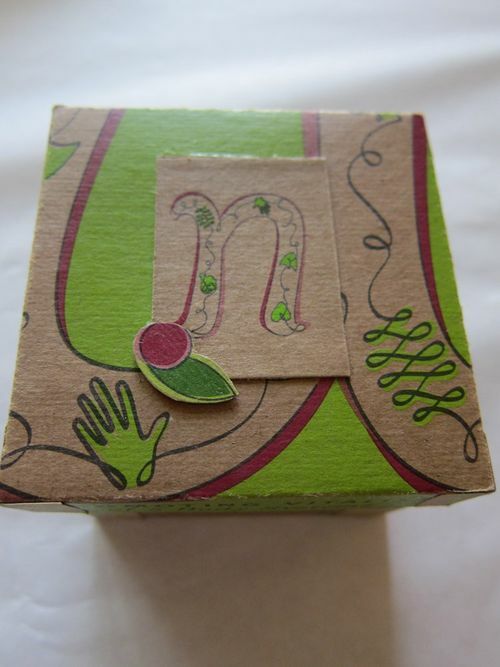 The box was made from a recycled cereal box. I have all the folded papers but didn’t finish cutting and gluing; another project for when I return. We finished the day folding a blizzard book and a crown book. I didn’t do a good job folding so I have to try again. Both books really interest me. I was really sorry when the week ended. I loved the workshop and would happily do it again. I was hoping for a little more emphasis on technique; my craftsmanship leaves much to be desired. But I think there are no secrets; I just have to be more careful. Rainy Monday in New York City. I can't decide where to go that would make it worth a possible drenching, having at times been very wet in New York rains. I wanted to go down to Chinatown and buy some probably arcane Chinese spices. When I was in Shanghai at that tea tasting ceremony I bought a wonderful, herbal concoction. I saved a little bit in hopes of finding someone who could tell me what was in it. Of course, I forgot to bring it with me. Maybe I'll just go down and buy a selection of sticks and bark. I know there are also tiny rose buds and jujubes. Today and tomorrow are my last days here. Wednesday morning I drive back with Robin and Steve. Rain is in the forecast all three days. Besides camera shopping, I've been to Kalustyan, a wonderful place for exotic, imported foods, spices, candies, etc. I could have spent hours there, but I had one more stop on Friday: Japan Society to see a beautiful show of Kuniyoshi woodblock prints. Very satisfying. On Saturday, Renee and I went to the Asia Society and then a movie. Yesterday I went to the Rubin Museum with Phyllis. Two featured exhibits were about death: Remember That You Will Die, and Bardo: The Tibetan Art of the Afterlife. The idea of Remember That You Will Die rather bothers me in the abstract, but the exhibit itself was not troubling; I could only distantly relate to it. My father lived to a few days short of his 94th birthday. When he was 92 the nursing home sent him to the hospital because he coughed up blood. They called me; I rushed to the facility, and got there after he had been given a chest x-ray, an electro-cardiogram and no clear diagnosis. The doctor was about to put a tube down his throat to determine where he was bleeding. My father had a living will, a "Do not resuscitate" order and I knew he did not want the procedure. I had a long, terrible conversation with the doctor: What would he do if he found the source of the bleeding? We would not permit surgery. He said Daddy might bleed to death. I asked if it would hurt. On being told no, I was forced to tell him to let my father die. My father was grateful, but the conversation devastated me. Equally awful was the conversation I had with the nursing home. My father was going blind from macular degeneration and becoming increasingly deaf. I'm know he found no good way to cope with this and wanted to die. I'm sure he died when his life became unbearable. I am pleased I was able to keep him from one more pointless indignity and a bad sore throat. My mother lived to 89. She was completely demented; did not know who my father was, or who I was; saw visions and finally spent most of her last days unconscious. My father took care of her until four days before her death, when unconscious and incontinent I insisted she be taken to a nursing home. After two days the doctor called me and asked if he could take her to the hospital. I said no. He then called my brother, who had little to do with my mother's care, who said yes. For the next two days my comatose mother was enthroned on a kind of pedestal bed with multiple tubes from her body to multiple machines. Then she died. Those two days cost Medicare $10,000 in 1995. Assuming those multiple machines could have saved her, what would be the point? So more money could be spent on maintaining a completely meaningless life? I think there should be universal healthcare. I think there should be single payer universal healthcare, although I don't believe it will happen in my lifetime. I don't believe the government wants to kill me or keep me from living the fullest possible life. I would like the government and the healthcare system to allow me to die when my time has come. For a great discussion of the economics of healthcare listen to this program from the Brian Lehrer show on WNYC. Brian Lehrer has many great discussions about healthcare and other matters of pressing interest. Monday the New York Times had an excellent article titled, "For the Elderly, Being Heard About Life’s End", that subject we don’t want to acknowledge. You can read it here. They say all the things I want to say. I’m in San Francisco this week; my internet access is only so-so. I’ll tell you all about it when I return home on Saturday.